I apparently managed to not get a "Before" photo of this antique chest on chest style dresser / chest of drawers. 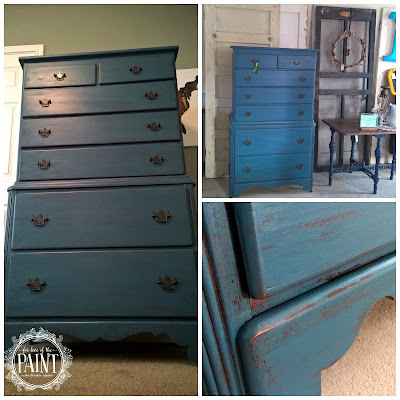 But I really liked the way it turned out, using layers of Annie Sloan Chalk Paint in a Florence blend, Primer Red, and Aubusson to accent the original shape and style. I'm always a little nervous when I try something different, but often end up loving the results! This is one of those times - the carved details on the side and the beautiful antique texture of this piece really pop now; what do you think? Most of the layering you see below is from the primary paint application; however, I also did distress back gently at the edges to ensure I captured the natural wear points as well. This also shows you how much lighting can impact the appearance of these paints. They are so nuanced and beautiful that the light/shadow balance and other colors in the room can really pick up on different details and look like a virtually different piece! I think of them as chameleons - they can blend into all sorts of spaces and still look natural and beautiful.